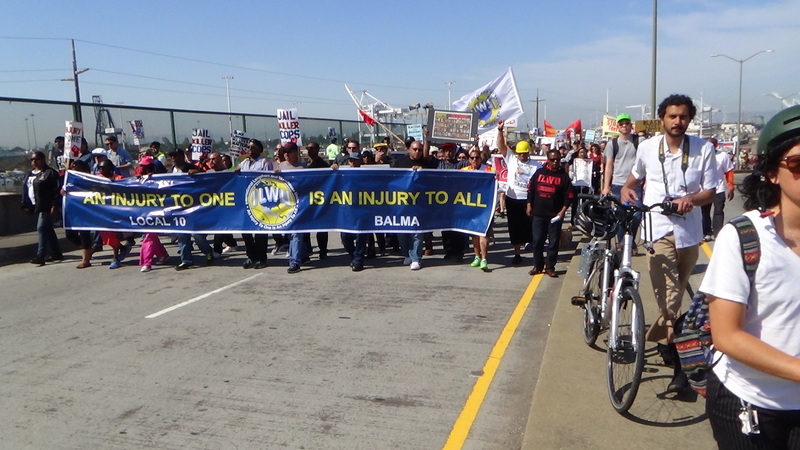 May Day is International Workers’ Day, and ILWU Local 10 will be leading a march in recognition of this day in San Francisco. This is the second year that Local 10 led a May Day event in this area, and like last year it the central theme was a protest against the wave of racism and violence of the police. But what has been accomplished? Since last May Day in SF alone the police killed Mario Woods and Luis Gongora. They brutally beat car theft suspect Stanislov Petrov, as he lay helpless on the ground (thus proving that while racism is a major factor, it’s not the only one). How many other such cases exist we will never know, since the only reason Petrov’s assault came to light is that it happened to have been caught on a security camera. Left: Police about to execute Mario Woods. Right: Police assaulting Stanislav Petrov. In both cases the politicians, Republicans and Democrats alike, have done their utmost to cover up for the cops. By using a contract clause to call their members off the job this May Day, Local 10 is raising the specter of a general political work stoppage. (In fact, Local 10 is going one step beyond that clause by not seeking the “agreement” of the employer. Good for them.) Equally important, they are helping draw attention to the issue of police abuse and police racism. The fact that no other union is doiong so is not an accident: I was in Ferguson shortly after Michael Brown was gunned down by the police. There, a community member who was in the United Auto Workers told me that his local union leaders had told him regarding Brown’s killing, “this is not our battle.” Why isn’t it labor’s battle? How many of our members and their families get assaulted or harassed by police? And don’t the police and the entire criminal (in)justice system side with the employers whenever there is a labor conflict? And shouldn’t the unions be leading the fight for justice for all? Yes, yes and yes. The sad truth is that the union leadership in general take their cue from the Democratic Party on issues like this. That’s why they seek to ignore it. 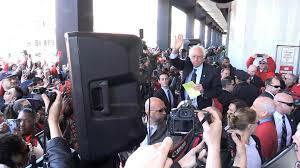 Bernie Sanders speaking to striking Verizon workers. Many Democrats come out to talk to striking workers. That is easy. But a real workers’ leader would be mobilizing his or her supporters to come out an help build mass pickets. Francisco is a perfect example; it’s a city that is overwhelmingly Democratic. These same Democratic politicians continue to cover up for the police. How can labor protest these actions by the police, while supporting these same politicians who are covering up for it? For labor to be taken seriously, they must mobilize their membership. But yet their leaders are granting concessions to the employers without even a struggle. They are telling their members, “you must do with less so your bosses can profit more from your labor.” How can the members be enthusiastic about a union that does that? So, let’s make this May Day a real international workers day, one where we don’t mourn, we organize – to start to build a movement from the ground up that changes the direction of this country and the world, including the direction of our unions. Let’s get our unions to stand on their own two feet, both on the job and in the political arena by breaking with the Democrats and joining with the movement in the streets and communities to build a radical, mass working class political party. And let’s link that with a struggle against this racist, exploitative capitalist system and for real, genuine socialism. Let’s remember the “international” in “International Workers’ Day” and reach out to those workers who are in struggle around the works, from Syria (where they are fighting the double-headed monster of the Assad regime and the Islamic fundamentalists) to China (where there has been a huge increase in strikes recently), etc. Let’s recognize that International Workers Day means that we, as workers and through out own organizations, are the only ones capable of ending war, racism, sexism and environmental destruction. The author speaking last May Day.